Need a custom system?? Contact us!! 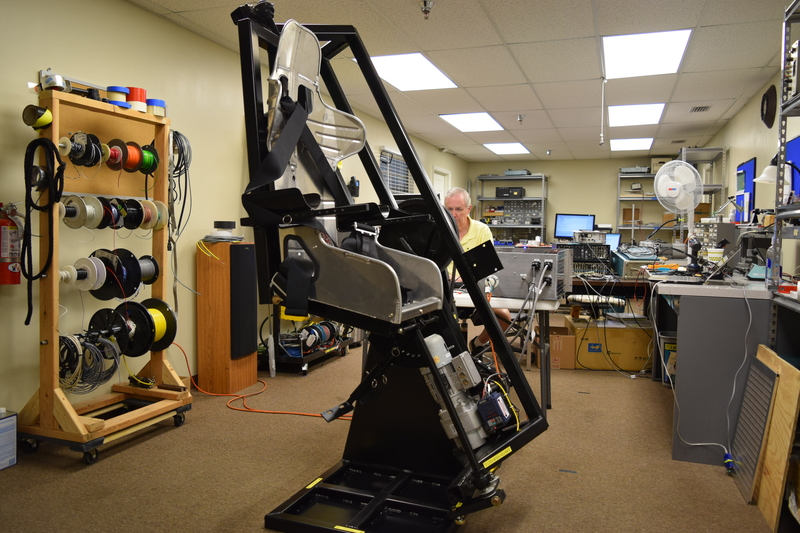 The Motion Cockpit Trainer was developed to assist a customer with designing cockpits for space flight. The pitch axis was designed to do ±360degrees continuous. The roll axis was designed for ±10degrees only, but can be modified for ±360 degrees. The pitch axis is rate controlled by software so that the customer could set it and allow it to slowly rotate for test. The system was designed so that either the operator or the pilot via joystick can control the seat in space. The system itself has an integrated braking system in case of manual e-stop (either by the pilot or the operator) or power failure. A five-point harness with cupped arm rests and foot rests with strapping belts keeps the pilot secure during operation. With the computer and software option, the system can monitor the position of each axis and the operation of the drive amplifiers that control the system to make sure that everything is operating properly. The system runs on 220VAC single phase or can be used with a transformer to run on 110VAC. The current requirement for slow operation is around 5 amps at 220VAC. The system has been designed to be as compact as possible. It will fit through a standard 36″ wide door. Weight has been kept to a minimum as the system weights about 250 pounds. Mounting holes in the bottom plate allows for the system to be bolted to the floor for operation. You can read more about how this system was used by the customer here. The first customer required a high angle sea state 6 six axis motion base to test antennas for shipboard communications. Specialized Sea State Software was designed for this application and is available for purchase. The second customer required as much angularity as possible with a ±360 degrees azimuth axis. The solution for this customer was to design a motion base platform that could do ±35degrees in roll and pitch with the azimuth axis built into the top. The assembly for the azimuth axis had to clear the pushrods for the motion base platform. A second motion base platform was design to provide ±20degrees in roll and pitch. This would give the system ±55degrees in roll and pitch. This is the highest angularity system that we have ever produced. The second motion base platform was mounted to the azimuth which allowed the second platform to also rotate in space. Specialized software was designed for this system to allow the customer complete control of the system. This system can be modified with the bandwidth and backlash option for precision testing of equipment on the motion base. It could also be used for antenna testing for sea state. Due to the overhung load problems with this system, the payload for this system is 500 pounds. The system lost some of its payload ability due to the second platform, but if the second platform is removed, the payload is about 1800 pounds and can be modified for higher payloads. This customer required a two axis (roll and pitch) motion base platform that could do as close to 45 degrees of angularity as possible. We modified an existing design to deliver as close to what they required. They required at least 500 pounds for the payload with an offset CG height. Need a custom angularity?? Contact us!! This system was design for General Dynamics Electric Boat Division. The customer specified a 4,000 pound payload, 10' x 10' x 7' box, ±45˚ in roll and pitch, ±30˚/sec for velocity and ±10˚/sec sq for acceleration. The customer was installing the actual control room for the submarine trainer. The system can be modified and works similar to the Motion Cockpit Trainer above. Big or Small?? Contact us!! We were contacted by a customer to update and add motion to several T-34 trainers. The old feedback control system had to be removed and our Model 400-x had to be installed and integrated to the existing linkages. Then, the entire cockpit had to be installed on the top of our 710-3-4000 motion base platform system. Once the entire assembly was built, the now updated system and motion platform had to be integrated to the Host. There was several of these systems made. Designed for Reflectone, this three axis zero gravity motion chair could be used for VR purposes now and is totally customizable. Something that has never been built?? Contact us!! Servos & Simulation has created several custom motion base platform systems for customers throughout our long history of engineering in the aerospace industry.